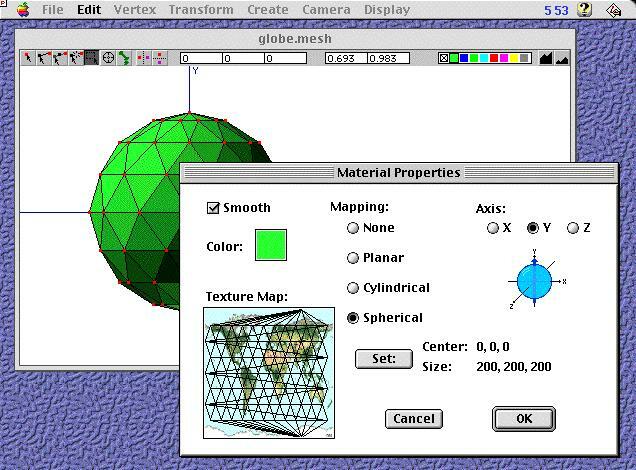 Meshwork is a 3D triangle-mesh modeling program for MacOS. It is designed especially for making compact, efficient objects for use in 3D games or on the web. It imports and exports several file formats, including DXF and optimized 3DMF. It can also be used in conjunction with meQanno to produce models for MacQuake, or in OpenGL applications. "Great work you are doing. I really love Meshwork! ... Do you realize, I have wanted and waited 15 years for this?" "I want to thank you for this incredible piece of software... The mesh modeler inside INFINI-D is very limited and I was glad when I found the existence of MESHWORK." "It is a tool no Mac 3D game developer should be without. I also make use of Lightwave and Ray Dream Studio for modeling but your application looks much better suited to my needs." "Finally, a simple 3d program to create Quake-like models in!!! WAHOO!" (PowerPC users should download the first file, 68k users the second.) The above links are the full distribution, including docs, samples, and the registration program. But if you just need an update to the application, then you can download meshwork-nodocs.sit.hqx or meshwork68k-nodocs.sit.hqx instead. See the Release Notes for information on how this version differs from previous releases. Meshwork is a shareware application; you can use it for evaluation purposes for 30 days, but after that, please purchase a licence for continued use. Single-user licenses cost $30, and may be purchased via the "Register" application included with Meshwork, or on the web via Kagi's secure server. The Meshwork Manual is available both here (online) and in the Meshwork distribution. It includes introductory material, topics in depth, a reference section and a tutorial. There is a mailing list for discussion of Meshwork use, tips and tricks, features you'd like to see, and so on. You can subscribe by sending mail to meshwork-subscribe@egroups.com, or via the eGroup web interface. You can read the message archives at the same place. The list is open to both registered users, and folks who are interested but have not registered yet. Meshwork is a very high-quality application, but bugs happen. I'll fix these bugs as soon as I can; but until I do, they'll be listed here so you can be forewarned. VRML import is listed in the menus but not yet implemented; the menu item is permanently dimmed. There doesn't seem to be much demand for VRML import, since VRML is more of an output format -- most VRML developers work in the native format of their modelers and only export to VRML. So if you really want VRML input, be sure to let me know! Meshwork's display may get confused (points drawn in the wrong place) if any points are more than 32,768 units away from the origin. Users of 3dfx cards (like the Voodoo and Voodoo2) with the RAVE extension set will have problems with Meshwork's 3D Preview. I'm working on this, but so far have been unsuccessful in making it work properly. Until it's fixed, users with this setup will need to avoid the 3D Preview (export to 3DMF and view with SimpleText instead), or disable your 3dfx extensions while using Meshwork. If you use Quake, you will definately want to see meQanno, a Quake modeller that works in conjunction with Meshwork. Users of PuppetTime will find Meshwork very useful for generating new puppet models, as described in "Making PuppetTime Puppets". Meshwork's lean, low-polygon-count models are perfect for use as puppets. Check out D-Form, a utility that applies various deformations to a mesh. The author of D-Form and I are working together to ensure that it and Meshwork can be used together smoothly. If you play Avara, you can use Meshwork and DXF import/export to create new game objects (see the Level Design Guide for details). I'm considering some enhancements to support more Avara features like multicolor objects; if this interests you, be sure to let me know. Users of Meshwork's 3DMF output may also find Pangea's 3D Tools quite useful. In particular, check out 3DMF Mapper which lets you adjust texture mapping on a vertex-by-vertex basis. If you are an OpenGL developer you'll want to look at Using Meshwork with OpenGL, which links to sample code and a utility for converting Meshwork 3DMF files into an OpenGL-friendly format.